Usual end of week reminder to plan to spend some me-time, family or friend time, be with nature time, do nothing time and I am adding napping time. I love pictures like this. Curiously, most of them are with Daddy. Need to think about that. I do advocate naps and often the best are when the kids are napping. 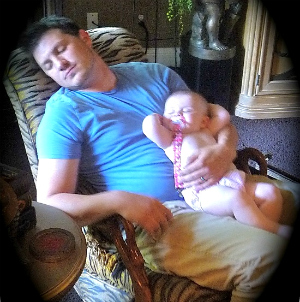 I am advocate of family naps. This week I talked a bit about good enough parenting. For the weekend think of more than good enough naps. I know I will get mine in. Soon, I will be signing off until Saturday after sunset. Signing off to sign on a more hands-on-life is one way to stay strong. PS: Just a quick reminder my 76th birthday, March 21st, is also the launch date of my newest E-book. If you are on Facebook, sign-up for the party. Read all about it here Emotional Fitness Facebook Page; give the page a like and be in the lottery for some giveaways. Sharing is caring and I hope you will share my birthday with me. This entry was posted in Parenting Issues and tagged Emotional fitness, Emotional Health, Health and mental health, Katherine Gordy Levine, Nap time, Parenting advice, Parents Are People Too, postaday, Self-care, weekend break time. Bookmark the permalink.